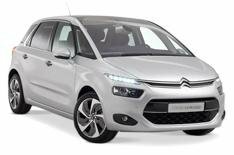 2013 Citroen C4 Picasso passenger ride | What Car? The previous Citroen C4 Picasso was little more than a shorter version of the Grand C4 with two fewer seats. However, this second-generation model has been designed to be sleeker and sportier than its seven-seat sister, which follows next January. The front-end of the new car is particularly striking, thanks to slim daytime running lights up by the leading edge of the bonnet. Cleverly, these lights incorporate the front indicators, while the separate headlights are positioned lower down; theyre xenons on pricier variants. Big wheels will also be available and Citroen claims these wont ruin the ride because the car is built on an all-new platform with suspension that was designed from the outset to work with low-profile tyres. The company has used composites, aluminium and high-strength steel in the new C4 Picassos construction to help make it 140kg lighter than its predecessor and improve both performance and efficiency. Whats the 2013 Citroen C4 Picasso like inside? The new C4 Picasso is shorter and lower than the car it replaces but, thanks to clever packaging, boot capacity has grown by 37 litres to 537 around 60 more than a Ford C-Max offers. You also get three rear seats that can be slid back and forth, reclined or folded flat independently of one another, and while some MPVs have a raised tunnel that gets in the way of the central passengers feet, the C4 Picassos floor is totally flat. The fact that the rear seats all come with ISOFIX child seat mountings adds to the practicality, and theres enough head- and legroom for six-footers. However, its not all good news because the cars side pillars curve inwards quite dramatically, which can make those in the outer rear seats feel hemmed in. Things are better upfront, where the windscreen extends back into the roof to create an airy feel, and theres load of adjustment for the driver. Theres also a smartly trimmed dashboard, and most of the cars functions are controlled through a touch-screen with large, easy-to-hit icons. Its just a pity Citroen hasnt fitted separate controls for the air-conditioning; you have to adjust the cabin temperature and fan speed through the touch-screen, which forces you to switch between menus more often than you normally would. Citroen wont let us drive the new C4 Picasso until next month, but we have been driven in prototypes, which the company says are 95% representative. The two cars we spent time in (a manual and a clutchless manual) had the companys e-HDi 115 diesel engine, and this is impressively smooth and quiet. Wind noise is also kept to a minimum, even at motorway speeds. However, theres a fair bit of road noise, and when the clutchless manual is in auto mode, it still feels slow and jerky compared with more expensive conventional autos. The new C4 Picassos suspension seems to put comfort before agility, which is no bad thing in an MPV, although you could feel a bit of shimmy from the rear end in the prototype cars even on smooth roads. Diesel engines will make up the core of the range, with the e-HDi 90 Airdream model a particularly efficient option; it does average economy of 74.3mpg and emits just 98g/km of CO2. The e-HDi 115 is also impressively efficient, managing 70.6mpg and 104g/km when combined with Citroens clutchless manual gearbox (or 105g/km with a conventional manual). Alternatively, you may want to wait for the 148bhp Blue HDi engine with emissions of 110g/km that will be introduced before the end of the year. Prices are still to be set, but Citroen says theyll be in-line with those of the outgoing C4 Picasso and that the entry point to the range might even be slightly lower. Dont think that Citroen is planning to skimp on equipment, either. Every model will come with alloy wheels, Bluetooth, a seven-inch colour touch-screen and a six-speaker stereo with a USB socket. Meanwhile, DAB will be standard from the second trim upwards, and range-topping models will have everything from adaptive cruise control to a front passengers seat that reclines like an old-school business class chair. The new C4 Picasso looks like its going to be an appealing alternative to rival five-seat MPVs such as the Ford C-Max and Renault Scenic.